This historic instrument was rebuilt in 2015-2016. Unlike many others this complete rebuild comes with all new action parts: hammers, whippens, back action,new strings, bridge caps, pinblock, and action felt. It has a custom soundboard designed by top re-builder Nick Gravagne, personally signed and with authentication stamp. Cabinet completely refinished in original ebony satin. 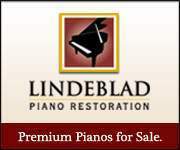 All work on the piano done by former Steinway employee. 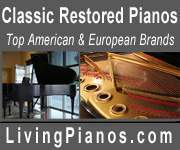 It retains the original three-bridge design and the original ivories which are in excellent condition. Ivory inspection report allows for legal sale across state lines. Comes with custom made padded nylon cover, duet bench, adjustable artist bench and humidity control system. The delicate, responsive touch makes for subtle expressiveness across the range. The resonant bass is especially well-suited for music of the Romantic period. It has been lovingly and carefully maintained by top-notch RPTs. Downsizing won't permit me to have two Steinways at home.